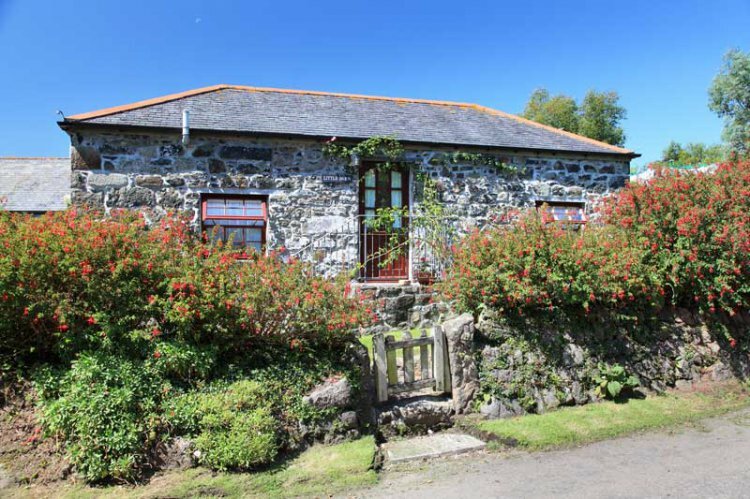 A delightful Cornish stone barn conversion dating back over 100 years. Just right for two to share a cosy holiday on the fringes of Cadgwith Cove. Just a ten minute stroll will take you into the famous fishing cove with its thatched roofs, good pub and fishing boats pulled up high on the shingle beach. A beautiful and tranquil setting. Cadgwith Little Barn is entered up four stone steps and through a stable door. Although compact and open plan, the quality of the furniture and fittings is unusually high for such a cottage. The airiness and light of the cottage is also a real feature, helped by the ceramic flooring and glazed double doors that lead out onto your private patio, this gets the sun from 2pm until late evening. The double pine bed has bedside shelves and lamps and there is a built-in wardrobe for your convenience. Two easy chairs provide ample comfort for sitting and the digital flat screen TV/DVD/iPod player, together with a radio/CD player provide the entertainment. The kitchen area is very well-equipped with electric oven and ceramic hob with extractor over, fridge with ice box, microwave and washing machine. This is complemented with quality stainless steel pans and utensils and 'Cornish Blue' crockery. There is also a folding dining table and chairs. The shower room offers surprising space and luxury with its double cubicle with electric shower over, matching toilet and handbasin with shaver point. Double doors lead out to a sunny patio with built-in BBQ and chiminea, quality hard wood table and chairs (with cushions) and a parasol are provided. Rental includes bedlinen, electricity, heating and towels, also broadband facility. Parking available on the ample driveway for one car. Dog accepted at £25 per week. Smoking only permitted outside please. Owners live on site in detached house.